Mary Fisher, a past doyenne of American cuisine and writer recommended in her charming book Consider the Oyster a good Chablis to float oysters down as the safest wine to accompany these wintry pleasures, with the same chilled temperature as the oysters themselves. But with due irreverence, befitting an American connoisseur, she remarked: “Oysters, being almost universal, can be and have been eaten with perhaps a wider variety of beverages than almost any other dish I can think of…and less disastrously. They lend themselves to the whims of every cool and temperate climate, so that one man can drink wine with them, another beer, and another fermented buttermilk, and no man will be wrong” (p. 69). Obviously local and patriotic customs exercise their traditions in the choice of drink to accompany oysters, so that white wine has been traditional along the Atlantic coast of France, and stout and Guinness in Britain and Ireland. And if you have had the fortune to belong to royalty or landed gentry then champagne has been de rigueur. But since traditions are so different, this gives a lot of latitude to the oyster eater to drink whatever he or she likes: water, wine, spirits or stout. However, many oyster devotees advise against destroying the unique taste of oysters by refraining from drinking anything but water and that wine cannot stand up to their rich array of gustatory sensations. A well-balanced, effervescing mineral water can be a simple but also sublime foil to oysters, taken only on their own. The taste of the oysters can, as such, be enjoyed in splendid isolation. The other, more elitist choice of bubbly is, of course, Champagne, which food buffs consider the drink to accompany oysters. But this does not mean any Champagne, rather the younger dry varieties of brut, extra brut and blanc de blancs (produced from the same grape as Chablis). The reasons for this, apart from its legendary association with luxury and sophistication, have to do not only with its light, refreshing, dry body, but also because both champagne and oysters were often consumed as appetizers before the main meal. Jean Anthelme Brillat-Savarin, the legendary French epicure, judge and gourmet, whose book on the pleasures of taste and “transcendental gastronomy” from the early 19th century was rendered into English by the same Mary Fisher, narrates the anecdote of a colleague who after eating thirty dozen or so oysters was quite capable of joining him for dinner without any loss of appetite. Incidentally, Brillat-Savarin had identified something akin to umami, long before the Japanese isolated it, though he called it osmazome, which he surmised was the substance that gave meats and their soups their characteristic odour. If other wines are considered, generally a dry chilled white wine, at the same temperature as the cold oysters, with plenty of acidity is the perfect match. But again it depends on the taste of the oyster. Usually, the acidity of the wine helps to dampen the salty taste of the oyster, though the sweeter the oyster, the fruitier the wine can be. However, the drier, high-acidic, mineral-rich wines of the cool Loire valley, where the soil lies on an ancient seabed of fossilised shells, like Chablis and some varieties of Pouilly-Fumé and Sancerre are those that traditionally first spring to mind; so too does any other grassy, crisp Sauvignon Blanc with its citric tones of acidity, and here New Zealand varieties from Marlborough on its South Island are especially appropriate and they regularly come up trumps in most oyster and wine tasting competitions. Bone-dry Rieslings are reliable choices, with their sharp, fresh flavours. Other wine grapes that may provide a similar palate of tastes of earthiness, citric fruit and leanness are in particular Grüner Veltliner and Albariño (or Alvarinho in Portugal), as well as some Pinot Blanc (particularly those from Alsace) and Chenin Blanc (especially wines from Savennières), or Pineau de la Loire as it is also known in that region region. Another classic is a Muscadet-Sèvre et Maine, made from the Melon de Bourgogne grape, grown on mineral-rich soil and aged sur lie. A good thumb-rule is look for dry, white wines from cooler climates (where the grapes ripen more slowly) with high acidity, grown on stonier ground, for example, with a preponderance of limestone, silex, flint or marlstone. However, the Sauvignon Blanc grape retains its tartier flavour wherever it grows, whilst the Mediterranean Piquepoul Blanc grape has the ability to produce acidic, stong dry wines, which blend well with shellfish. What should be avoided are the buttery, heavier and oak-matured wines, often associated with most Chardonnays (although some lighter ones from Côte de Beaune and, of course, Chablis make excellent companions) and other fruitier wines, unless grilled or cooked oysters are on offer or they happen to be of the creamier variety. As a more daring and irreverent alternative, it may even be possible to try a light, fresh Pinot Noir or Gamay (again from cooler climes like Burgundy), or a younger Cabernet Franc from the Loire, which have been known to pair well with the richer Ostrea edulis, again because these wines do tend to have a higher acidity. One reads of recommendations for drinking bourbon, vodka, gin, sake, martini, Campari and soda, and even a dry fino sherry like Manzanilla. Spirits and oysters can combine nicely in cocktail shots: one oyster bar-owner swears by his horseradish vodka, and the way it fits in with the Atlantic oyster, another by his stirred martini and its compatibility with the European native. Even a smoky single-malt and calvados have their aficionados. What are perhaps working here are the sharper tones and higher alcohol content. Similarly, as regards porter beers but more especially stout, it is their rich bitterness and roasted flavours that can help balance the freshness of oysters; Guinness is an old favourite and its texture gels well with the strong, metallic flavours of the European native oyster. 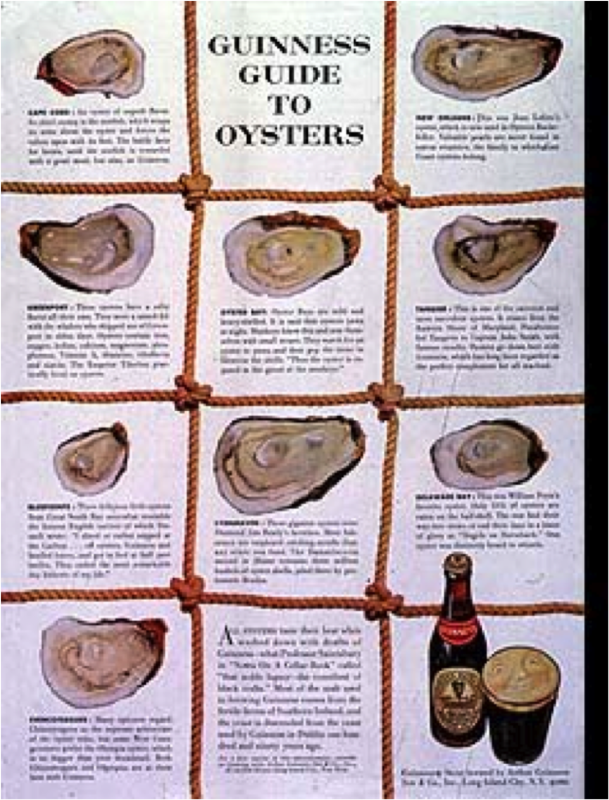 One of the original Mad Men, the iconic David Oglivy, created as one of his very first pioneering adverts “The Guinness Guide to Oysters” in 1950, extolling the virtues of the Atlantic oyster. According to another, Guinness even “made the oysters come out of their shells.” Yet another, preying on more primitive feelings, simply asked the question “Are you going native?” But stout or originally porter, brewed from roasted malt or barley, had long since been the drinks served up in the public bars of Victorian times and so became the natural complement to oysters for the general public. Attempts have been made to add oysters to the brewing process of stout (to enhance the nutritious content), and isolated, special brands of “Oyster Stout” have been brewed in various parts of the world, the first being made in 1929 in New Zealand. Porterhouse brewery, in Dublin, has been brewing an Oyster Stout for decades, warning vegetarians not to drink it. On the Mersea island, off the coast of Essex, a micro-brewery, produces a dark, malty oyster ale, using loads of oats, called Island Oyster, in which one local oyster per gallon (3.6 litres) has been added to the brew. Another similar ale produced by a small brewery in Bridport, Dorset and marketed under the name of Hix Oyster Ale is considered a rich, nutty and slightly sweet brew. On the other hand, neither Marston’s nor Adnam’s Oyster Stout are in any way brewed with oysters but are regarded as a good companions to a dish of oysters. On the eastern coast of America, a local brewery, Harpoon, in Boston introduced in May 2010 a limited edition beer, called Island Creek Oyster Stout, using about 180 briny and buttery Atlantic oysters in each kettle from Island Creek, just north of Cape Cod, and it has been described as a creamy, mineral-tainted brew with a roasted coffee and chocolate flavour. Since the taste of the oyster can be both challenging and sometimes quite unpredictable, there is a chance that the choice of drink loses out, but that should not mar the enjoyment of the meal. However, what seems more like the common denominator is that oysters, at their place of origin, go well with the local tipple, that is, what you are used to or simply what you like drinking. After all, what matters is that it’s all in the eye of the beholder or, more literally, on the tongue of the taster.